Irish Landscape Painter, Cork Artist, 18th Century, Biography and Paintings. great Irish Artists of the 18th Century. One of several Irish landscape artists to emerge in the second half of the eighteenth century - others being painters like George Mullins (fl.1763-75), the polished Thomas Roberts (1749-78), his Romantic-style brother Thomas Sautelle Roberts (c.1760-1826) and William Ashford (1746-1824) - Nathaniel Grogan was born in Cork. Apprenticed to his father, a turner and block-maker, he started drawing with chalk on board and attracted the attention of the great landscape painter John Butts (c.1728-1764) who greatly encouraged him. However, his father was so hostile to a career in art that Grogan joined the army while still in his teens and served several years overseas in America and the West Indies. 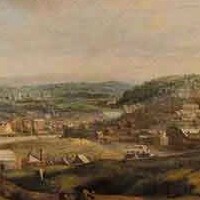 Returning to Cork, he set up as an artist - again encouraged by Butts - painting a wide range of works such as: landscapes, urban scenes of Cork including aquatint prints, decorative works and murals in stately homes, miniature oils depicting views of Cork City, as well as numerous scenes of Irish rural life - both real and imaginary. Among his masterpieces are: 'Boats in the River Lee Below Tivoli' (National Gallery of Ireland) and 'View of Cork' (Crawford Gallery). Four of Grogan's landscape paintings were shown in 1792 at the Free Society of Artists exhibition in London. Although Grogan enjoyed a significant reputation in Cork and remains one of the most interesting provincial artists in Ireland of the time, his works suffer from a lack of academic training which might otherwise have enabled him to become a great painter. Despite this weakness, he is regarded as one of the major Irish artists of the eighteenth century. He is buried at St Finbarr's Church in his native city.  For the evolution of Irish landscape painting, see History of Irish Art.